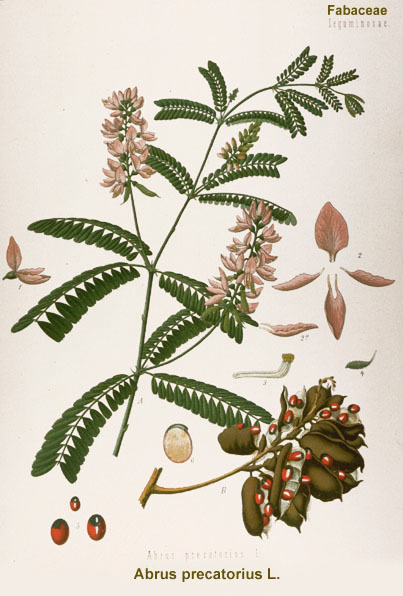 Abrus abrus (L.) W. Wight. Abrus precatorius is a slender, perennial climber that twines around trees, shrubs, and hedges. It has no special organs of attachment. It has a slender branch and a cylindrical wrinkled stem with a smooth-textured brown bark. Leaves are glabrous with long internodes. Leaves alternate petioled, 5-13 cm (2-5 in) long, even-pinnately compound with 5-15 pairs of leaflets, these oval to oblong, to 1.8 cm (< 1 in) long, with margins entire. Flowers are small and pale violet in colour with a short stalk, arranged in clusters. The ovary has a marginal placentation. The fruit, which is a pod, is flat, oblong and truncate- shaped with a sharp deflexed beak is about 3 to 4.5 cm long, 1.2 cm wide, and silky-textured. Each fruit contains from 3 to 5 oval-shaped seeds, about 0.6 cm. Abrin, anthocyanin, campesterol, choline, cycloartenol, gallic acid, trigonelline (seed); precol, abrol, abrasine and precasine (root); delphinidin (plant); glycyrrhizin (leaf, root). Cough, cold and colic (root decoction); as a nervine tonic, abortifacient, in stomach ulcers, skin maladies, diarrhea and dysentery (seed); in paralysis and sciatica (seed paste) and swellings (leaf juice), for inflammed eyes (leaves), seed paste is applied locally in sciatica, stiffness of shoulder joint and paralysis. Pillay et al., 2005 report an unusual case of poisoning involving the white seed variety of Abrus precatorius that caused serious manifestations in a middle-aged male who had consumed the seeds on the advice of a folk medicine practitioner. Abrin,a toxic protein obtained from the seeds of Abrus precatorius (jequirity bean), cause gastrointestinal toxicity. Chen YL, Chow LP, Tsugita A, Lin JY. The Complete Primary Structure of Abrin-a B Chain. FEBS Lett 1992;309:115-118. Johnson T. Medicinal Plants (Bentley and Trimen); CRC Ethnobotany Desk Reference. Kimura M, Sumizawa T, Funatsu G. The complete amino acid sequences of the B-chains of abrin-a and abrin-b, toxic proteins from the seeds of Abrus precatorius. Biosci Biotechnol Biochem 1993;57:166-169. Olsnes S, Pihl A Kinetics of binding of the toxic lectins abrin and ricin to surface receptors of human cells. J Biol Chem 1976; 251:3977-3984. Parrotta JA, Healing plants of Peninsular India. CAB International, Wallingford, 2001, UK.944 p.
Prakash & Mathur, Indian J Exp Biol, 1976, 14, 623. Uniyal et al., Medicinal Flora of Garhwal Himalayas.